I decided to build two subs. Due to the size of the enclosure, SAF became a potential problem :) and of course two subs means twice as much SAF ! Coming to my rescue was a furniture showroom catalog I came across while on business in the Seattle suburbs. 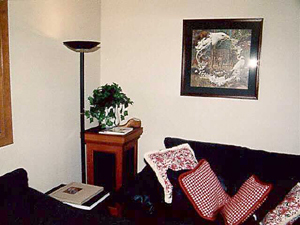 My wife liked the antique pedestals in the catalog pictures and agreed that subs of similar looks and function would be a great addition to the room. 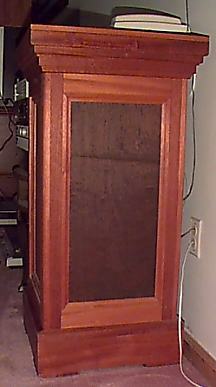 Here are pictures of the two resulting subs using the NHT1259 driver. Different cameras were used thus the colors vary. 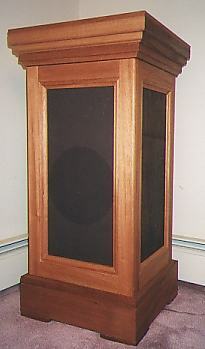 This is the first sub serving as a pedestal for a phone and answering machine. This is the second sub. This is another view of the second sub in the far corner of the room now flanked by 2 couches. This picture of the first sub has the most accurate colors (assuming "normal" monitor brightness, contrast, gamma and TrueColor graphics). The resulting sound is most impressive. The subs have incredible punch, and have usable output in the mid 20's. 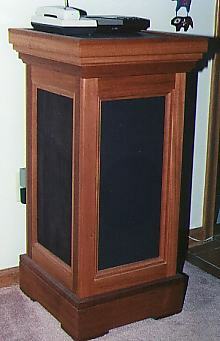 The sound is not boomy and does not have the "windy" sound often found on commercial bandpass units with undersized woofers. Cost was kept to a minimum by using scrap and recycled materials from a local surplus store. Each unit, including the driver, cost about $175. The superb quality of the driver, the simplicity of the box, and the relatively inexpensive materials makes a 1259 based sub the best sub value around. It is an ideal DIYers project.